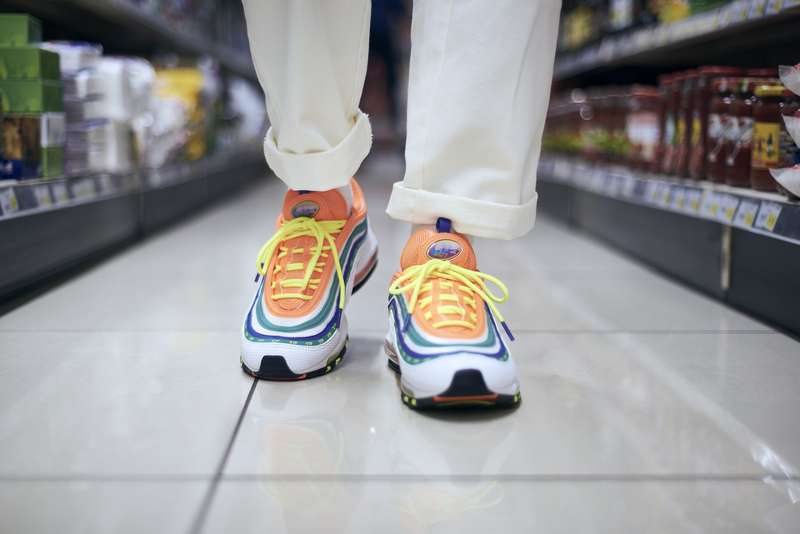 In 2018, the Nike: On Air competition brought thousands of participants to workshops in NYC, London, Paris, Seoul, Shanghai and Tokyo, where eager locals dreamed up shoe designs inspired by their local communities. By May, candidates’ designs had been put to the public vote, where 6 lucky winners (one from each city) were invited to work alongside Nike’s design team for a once-in-a-lifetime trip where the shoe designs they had dreamed up would be made into a reality. 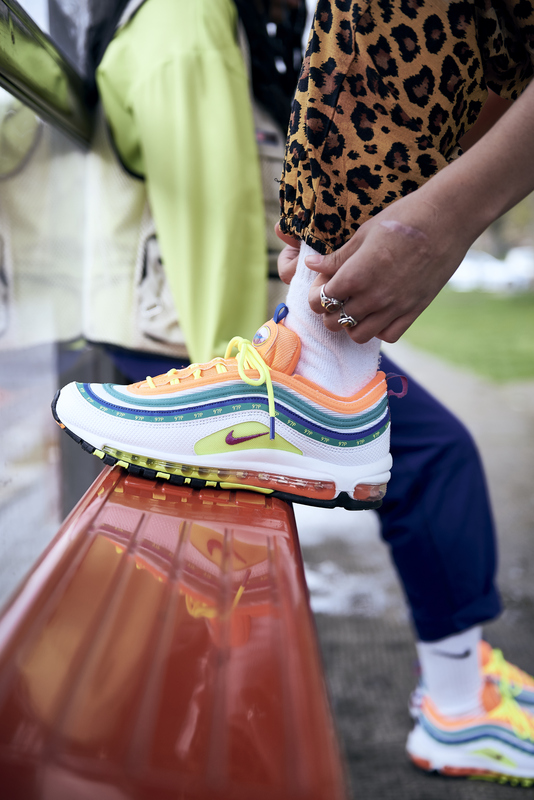 Permeated with personal nostalgia, Jasmine’s vibrant Air Max 97 design was inspired by a memorable date she had while overlooking London on Primrose Hill. Fittingly coined ‘London Summer of Love’, Jasmine dresses the shoe in vivacious hues to symbolise the happiness of falling for someone in the city. 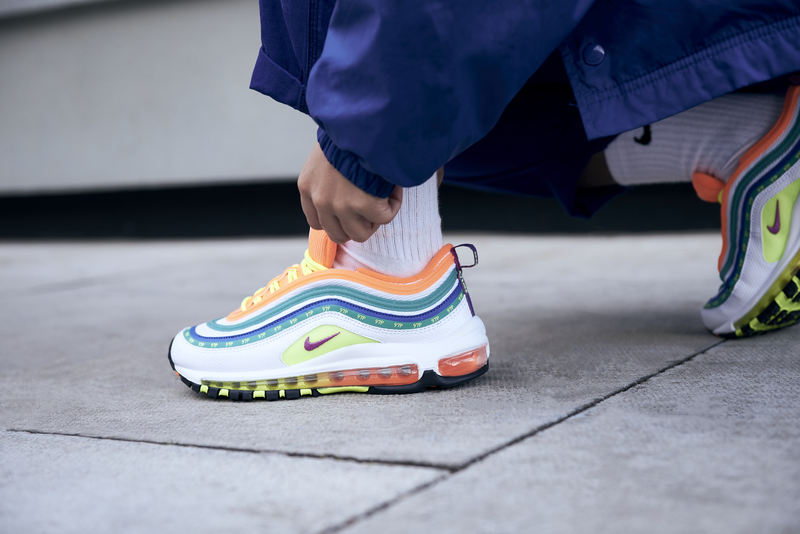 Hits of orange, deep green, volt and a balancing base of white paint the silhouette’s textile upper, detailed with minimal ‘97P’ branding throughout the mid panel and ‘Good Chat’ typography to the pull tab. Completing the colourful creation, a gaily-gradient Air bubble is embedded into the midsole. “There are so many wonderful buildings and places in my city, which is always moving and evolving”, she says. “I wanted the shoe to be fun and playful, that’s why you can switch the Swoosh and wear the strap or not—like a shoe under construction”. Pulling the shades Lou saw on that job site, cool hues of blue and grey sweep across the iteration’s uppers, highlighted with pops of yellow to the customisable sidewall Swoosh. The medial sidewall also features a unique deconstructed Swoosh, while an elastic buckle strap wraps around the midfoot to further the shoe’s industrial aesthetic. Lou’s design is rounded off very nicely, with an icy blue bubble outsole complementing the pair’s upper seamlessly. 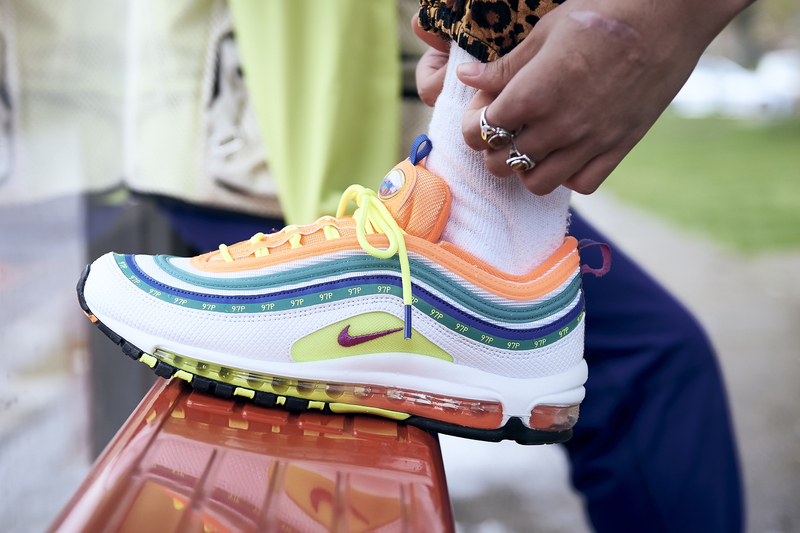 The London ‘Summer of Love’ Air Max 97 and the Paris ‘Works in Progress’ VaporMax Plus from the Nike: On Air contest will be available via the size? previews app and in their respective size? stores on Saturday 13th April, priced from £160.